Our friend Gary is 50 this month and decided that a “club” cruise to Cropredy for the bank holiday weekend was how he would like to celebrate his birthday. 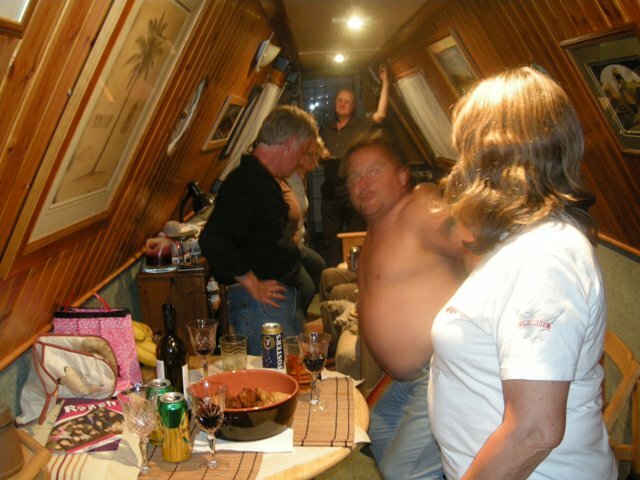 then back to Caz and Si’s boat for a party. 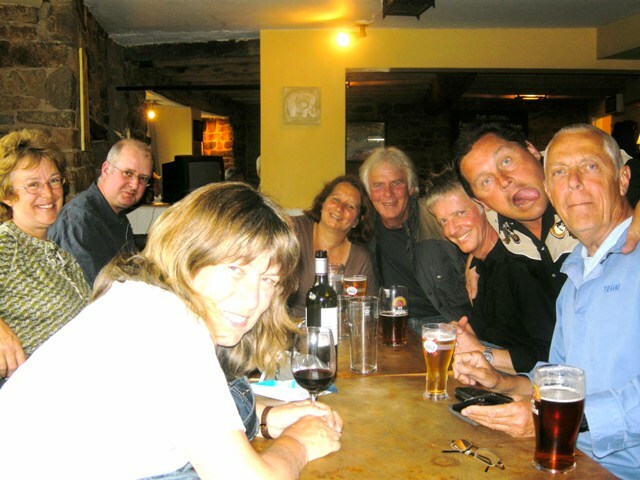 Vic and Gary played their guitars, then Paul got the dancing going with “Jilted John” to which Si did his party piece. The heat was turned up and Si stripped off and then Gary (not only guitarist but also fitness instructor) got us doing some aerobic dance movements…. how many people can line dance on a narrow boat? Paul is doing his bit with Jet too. 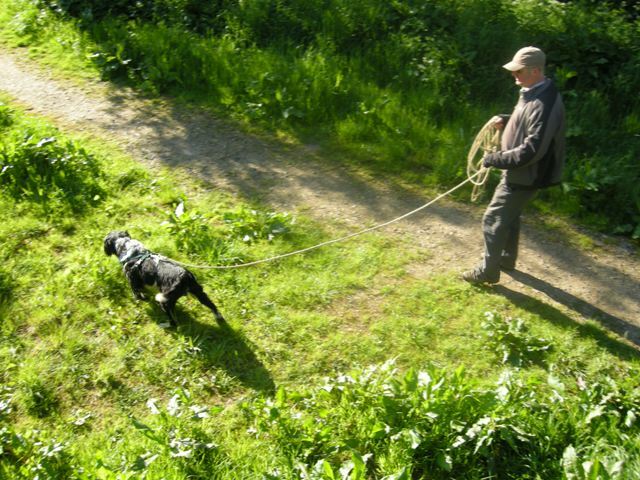 We need to be sure that Jet has bonded with us and the recall is 100% before we let Jet off the lead, but he is an energetic boy and needs lots of walks and games. The long line is working well..
except when you meet other people, dogs and cyclists – then you have to be pretty nifty gathering the line up before Jet takes them out! Pip seems to be able to dodge the line when we are palying ..
then its early to bed at the end of a long day. Well what a handful the new boy is – hooligan would be a good desription of his behaviour that first afternoon. Jet barked noon-stop in the car from the Blue Cross Centre at Lewknor to Trupp, where we all went for a walk and a much needed break. Back in the car, and a bit of radio 2, and the barking quietened somewhat. Poor boy must have been so confused, not really knowing us or what was going to happen to him. Another walk in Spiceball park, Banbury, then into the garden for introductions. No manners indoors though. He charged onto the boat, on the sofa, head in the bin and then jumped onto the bed! First thing we taught him was to get him into his bed and staying. Meal times were the next challenge. Jet expected to eat off the plate too! 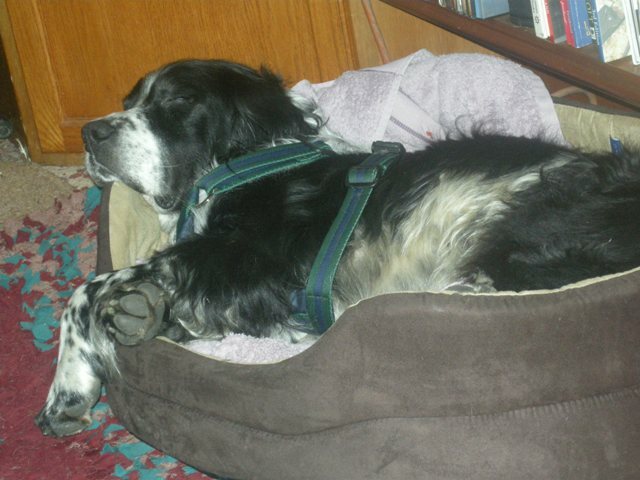 However being put back in his bed, gently but firmly, with lots of praise when he sat there, soon got him sorted. He is such a character, the way he looks up at you first with one eye and then the other! First dip in the canal yesterday, when he reveresed off the pontoon into the water. Paul was able to grab his harness and lift him out. A quick shake and Jet was off again, non the worse for his dip. More adventures soon. 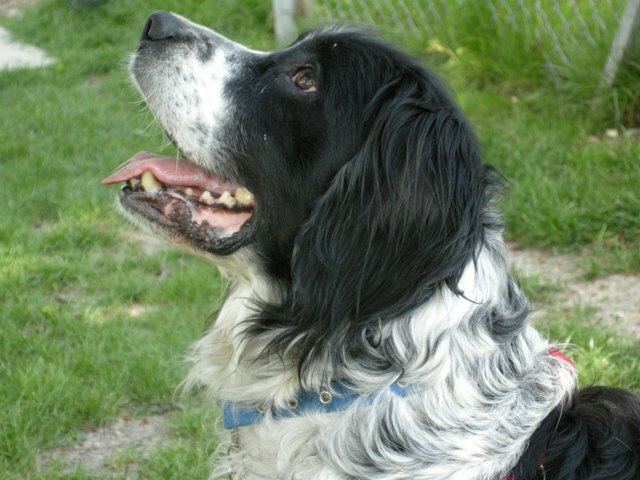 Great news, we are going to collect Jet on Saturday. He has had his dental work done and is recovering from the minor operation at the Blue Cross Centre. While he was having his teeth done the vet checked his eyes and reported some deterioration to the retina which will probably mean that Jet will lose his eyesight in later years. Pip’s eyes aren’t too good (and neither are mine) but she seems to manage OK.
Jet comes with several weeks Petplan insurance, bearing in mind we cannot claim in future for anything he has previously had treated (teeth, ears, cyst removal), should we carry on with the insurance? Ive gone mad and bought Jet a new bed, new harness, blanket, water bowl and some squeaky balls to throw. With that and the car hire costs for two weekends I’m being very nice to Paul at present as there is a bit of a hole in the savings account. Well it may as well be on Jet, the boys would only find expensive investments for us to help them with otherwise! Considering all the work and expense the Blue Cross have invested in Jet, I think a donation of £100 is very reasonable. If any of you are thinking of rehoming an animal do go to the Blue Cross Centres first. I have found their staff to be really supportive and helpful. They are very knowledgeable and trained in the latest behaoural theories so able to give sound, consistant advice. Their after care and support for new owners is excellent too. Here he is again, ready to go! A new boy to join the family? Pip and I have been really miserable since Roles died. I suddenly realised that the pack wasn’t complete one day, when Pip and I were out for a walk and I noticed she just hung round my legs and hardly stopped to sniff any interesting smells. 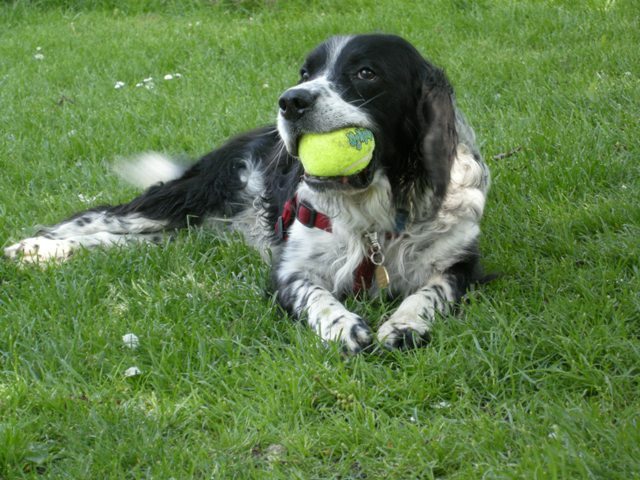 I couldn’t interest her in chasing a ball or any of the games we used to play – no other dog to compete with or to look after I guess. 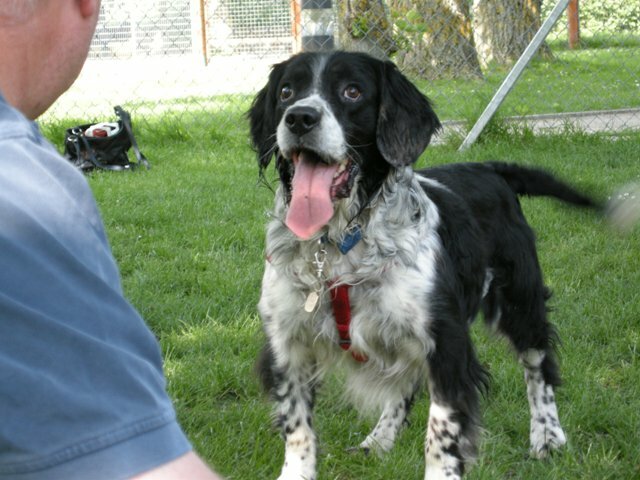 Yes and before you say it, there is a slight resemblance to Roles, (Roles was a Springer X Collie) and he is a little bigger than the jack Russel type dog we thought we would get, but we love him, and more important, Pip likes him. He is a real character and I hope that following our home visit inspection tomorrow (fingers crossed) we will be able to bring him to the boat soon. This will give us time to get him settled in before we go off on our summer cruise. Will keep you all posted. 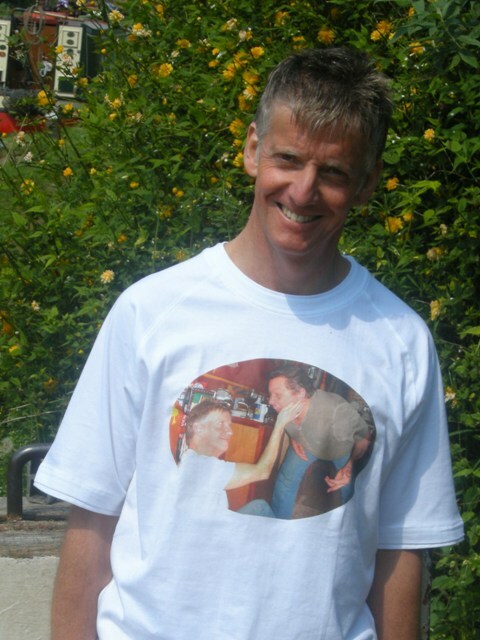 What fantastic weather – hope you are all managing to enjoy the sunshine – Paul and I are making the most of it. 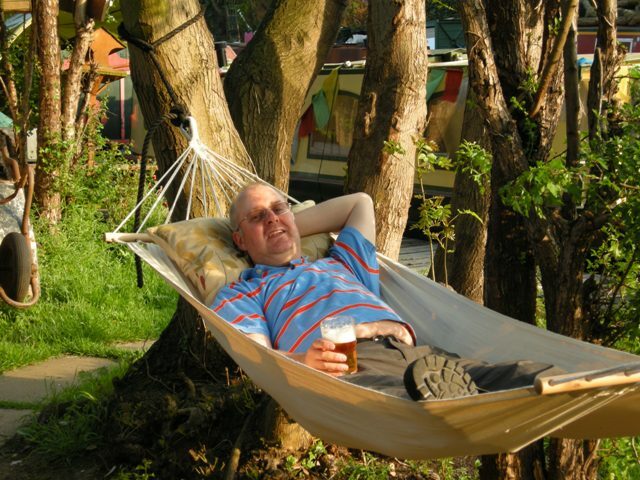 Do you remember the hammock – the one Paul was given for his 40th by his friends at JISC – well it has really come in handy. We have trees on our little garden, so Paul has tied the hammock up and you can see him testing it out! Had a great day last Friday with tea in bed and a nice cooked breakfast – thankyou to Paul. Ahhhh he does spoil me. I got some pressies – a new puppy (on a card), cds, voucher for Fat Face clothes (thanks to Anne). Barry and Julie joined us for a meal in the Boat at Thrupp and amongst other things presented me with a tin of memory mints for those senior moments! What are they trying to tell me? But oh joy, I was able to pick up my new camera today and have spend many happy hours trying it out. Thanks to Barry for the advice to buy a Nikon, and thanks again to Paul for organising the purchase. We think we have cracked it!! When I got back from moving boats ith Anne, we got a phone call from our friend in Banbury, who said a mooring had come available on the “arm” in Banbury. A number of advantages being a really cheap mooring fee, and good security behind a locked gate. So we jumped at the chance….and well here we are back in Banbury. 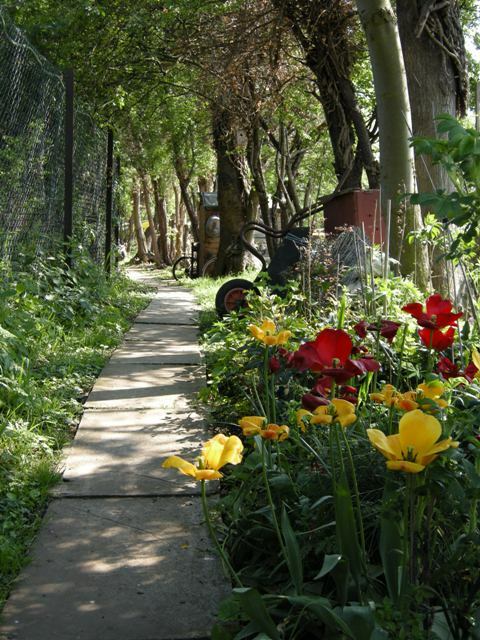 A touch of spring….this is the view down the pathway on our side of the moorings. You are currently browsing the Daniel Oakley blog archives for May, 2008.